What is the Grub Run? 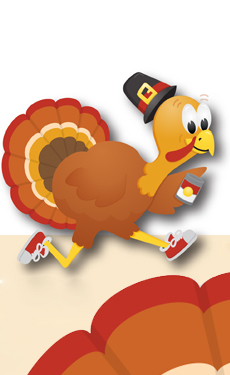 An unconventional 5k held on Thanksgiving Day at Texas Motor Speedway where participants run on the same track that their favorite race cars drivers race on! Oh, there are also a couple of "pit stops" where you will have the chance to preform extra credit activities to help make room for even more stuffing! Do I have to do the "Pit Stops"? No, you can trot on by if you like! Anyone! There are no age limitations. You're welcome to run, walk, crawl or skip through the course. When do I receive my shirt and bib? Shirts and bibs will be picked up at packet pick-up on race day morning starting at 7am. If I don't want to run, can I watch the runners? Absolutely! No need to register but we ask that you bring 5 cans of food to donate. How can my business help sponsor the Grub Run? Click here for sponsorship information. For additional information, please contact us.